Easter is the most well-attended church service of the year. Around the world, both inside and outside the church, people are talking about the resurrection, which makes for a very easy transition to share the gospel. To help you make the most of the opportunity, we’ve assembled some outreach ideas and resources that are designed to reach kids with the gospel. If you’re hosting an Easter egg hunt, just insert a “Kids’ Million Dollar Bill” into each egg, along with candy, and you’ve turned it into an effective outreach. Use the “Kids’ Curved Illusion” tract as an object lesson in Sunday school to teach children we’re easily tricked, and not to be tricked into thinking that we don’t need God (and explain the Law and gospel). 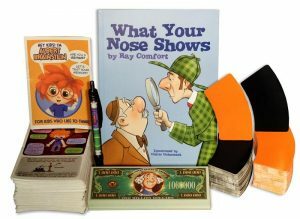 Do a storytime reading of What Your Nose Shows, which tells about God’s amazing genius in creation and debunks evolution. Go to a local park and hand out “Albert Brainstein” tracts. Simply offer them with a smile and say, “Happy Easter!” Because of the holiday, few will turn them away. Give What Your Nose Shows to an unsaved coworker as an Easter gift for their children. Attending a community Easter egg hunt? Bring “Kids’ Million Dollar Bills” to the event and hand them out to the children—they will happily accept them. If you’ll be spending time with family, both children and adults alike will be fascinated by the “Kids’ Curved Illusion”—which opens up an easy opportunity to hand them out to family members and get the gospel into their hands.This outreach kit is available only for Easter and contains $33 worth of resources for just $20. Be the first to review “Kids’ Easter Outreach Kit” Click here to cancel reply.